Just as the rainbow became an impulse reviving Wenlock and Mandeville, it is becoming a symbol dominating the whole space and stretching even beyond London, the heart of England. It is a play with a motive bridging individual sports, personalities and venues. It is the story of today’s Olympics. 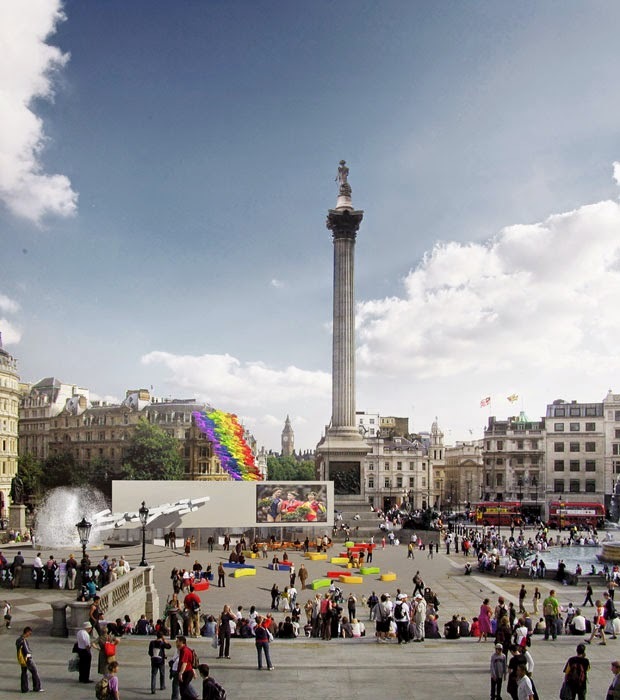 The rainbow stream is a signal that appears, from most access paths to Trafalgar Square, above the heads of comers. You can also see it from rooftops or the London Eye. 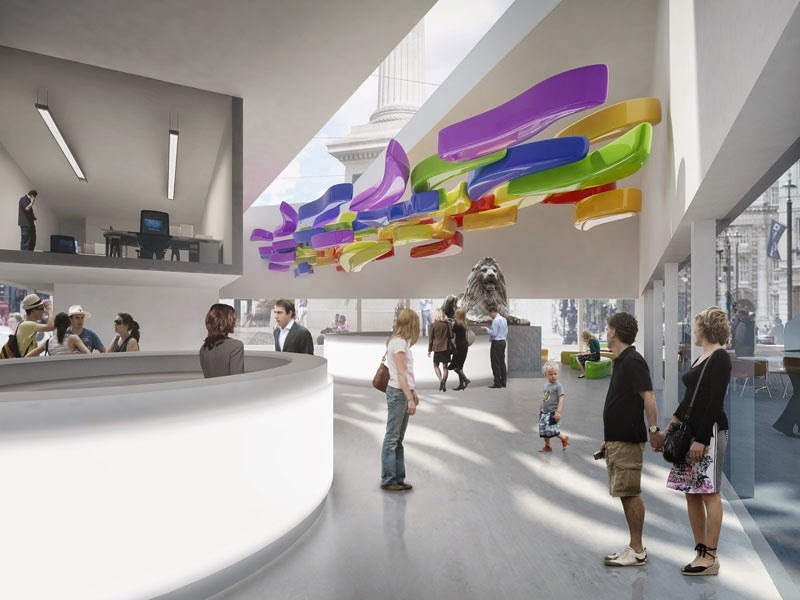 The building of the information stand itself is as accessible as possible from all the directions and the flow of people merges with the flow of colours and shapes. The space inside has been designed so that it is possible to freely pass the publicly accessible parts, yet providing zones such as a chill-out zone, a café, or an information zone, which loosely move outside the building space, integrating themselves in the people’s movement all around the square owing to movable and playful furniture. The information zone houses an information counter associated with selling souvenirs, while the refreshment zone is divided in a chill-out area, a bar and standing or sitting area. On the ground floor, there are bathroom facilities for men, women and the disabled, as well as a utility room. Offices, a storage room and technical facilities are located on the first floor. It is the stage that engages the space outside into the game. From one side of the fountain, it creates a part of the structure, and by means of lighting and dispersing water flows, it integrates the fountain in the rainbow story. The symbiosis between the original and the new is the most powerfully adjusted by integrating the fountain or the lion directly into the structure. In this case, a strong tradition of London Olympics is associated with its progressivity without standing impassively next to each other, but rather mixing in a geyser of ideas and thoughts. 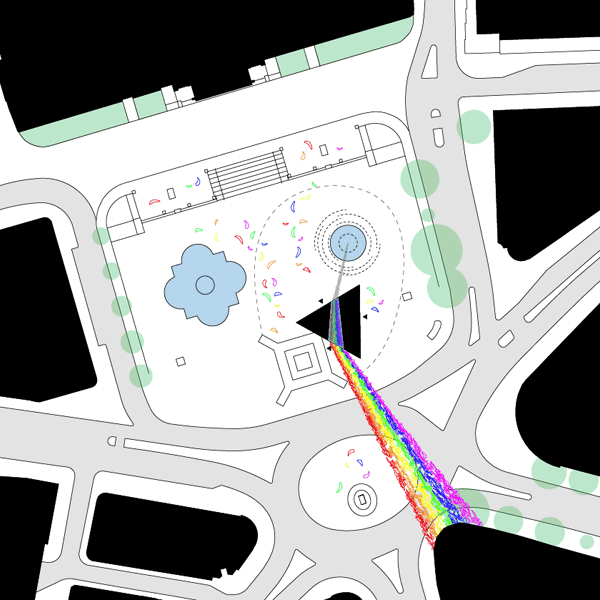 Likewise, the individual elements of the street furniture, corresponding with parts of the rainbow as for their shape, have been meant to spread in the area of London, referring in the streets and venues all around England to the centre, where everything intertwines and spreads to all directions. 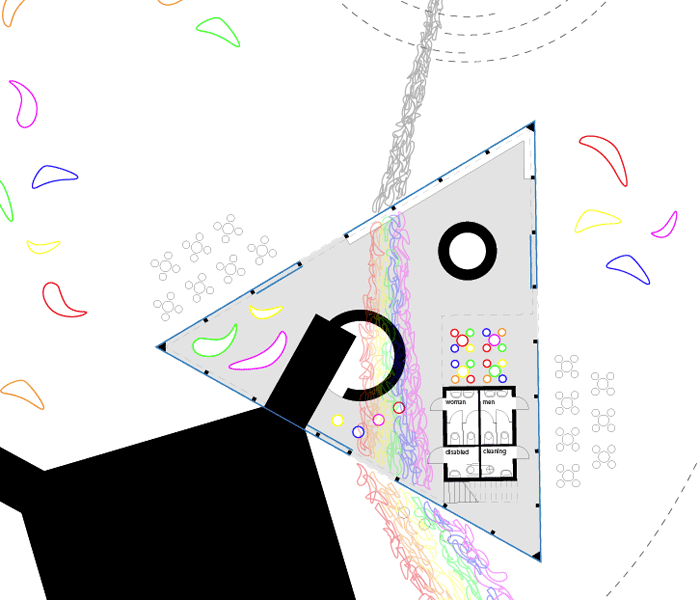 Individual parts of the rainbow, totalling 2012, may be subsequently sold as household furniture, souvenirs or Olympics memorabilia. The construction is a functional and dismountable as possible. Light steel elements and glass panels are easy to assemble, covering the upper part with a canopy so that the structure gives an impression of lightness and unity at the same time. An LED screen sized 7.6 m x 4.2 m (16:9) is installed in the upper part of the structure, facing the National Gallery as the most prominent part of the square. Due to a neat and unified shape of the façades, their surface may serve as a projection screen that can be used for screening, video mapping, or even, on special occasions, as part of the presentation of the visual style of the Olympics. The aim of the stand is to create a continuation of the story, providing a source of the rainbow filling England, London, visitors, sportspeople, and mascots with its colourful energy.